We have reached the last leg of our trip and in just a few days we are flying home to Stockholm. It’s a bit sad but at the same time exciting to get back into our home and kitchen. Eeeh, who am I fooling? We are absolutely devastated and are constantly trying to think of different excuses to stay here: “What if we got infected with a virus so we weren’t allowed on the airplane…” or “What would happen if one of our passports was eaten by a dog?”. Seriously, this trip has been unreal. We have connected with so many friendly people in Sydney, Melbourne and across New Zealand. Been invited to breakfasts, lunches and dinners by persons we had never met before and also got the chance to meet a bunch of readers on picnics, signings and events. We are now spending our last days revisiting our favourite spots, soaking up the sun and filling our bags with Elsa’s sea shells. We have a chapter about traveling with kids in our latest book, but considering how many questions we have received on the subject while we have been here, I think we might write something more about it in a later post. We tested and photographed this pancake recipe before we left Sweden, with the intention to post it while we were away. But somehow we completely forgot about it, until now. 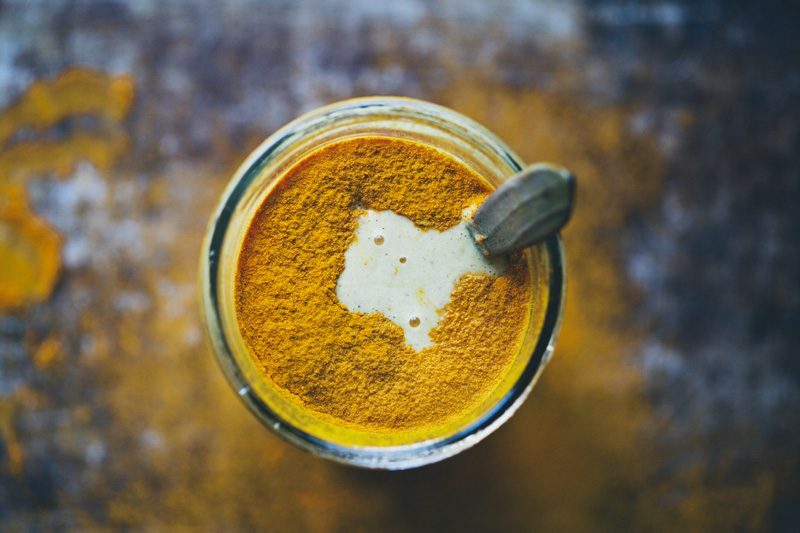 This is a recipe from our absolute favourite cookbook from 2014, Amy Chaplin’s At Home in the Whole Food Kitchen. We can’t recommend her book enough. If you like our food, you are going to love Amy’s. Her book was released in the US last year and will be out in Australia and the UK in June. 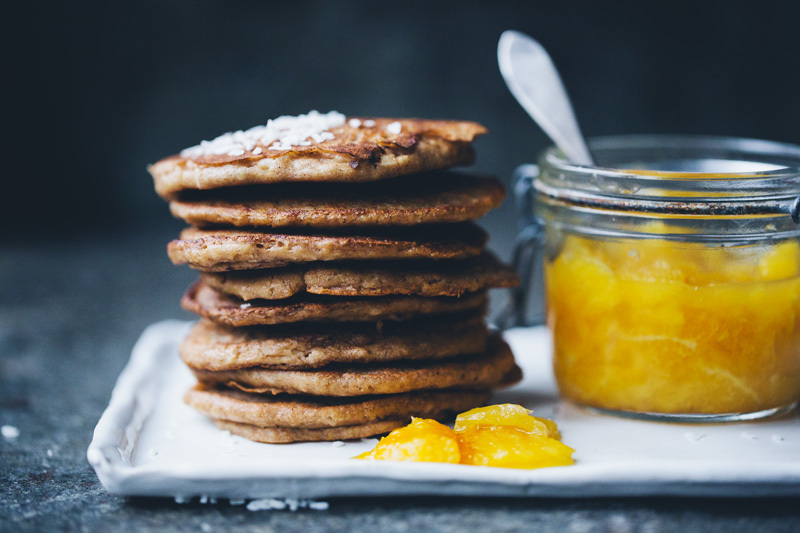 The pancakes are perfect together with our homemade Clementine Jam. 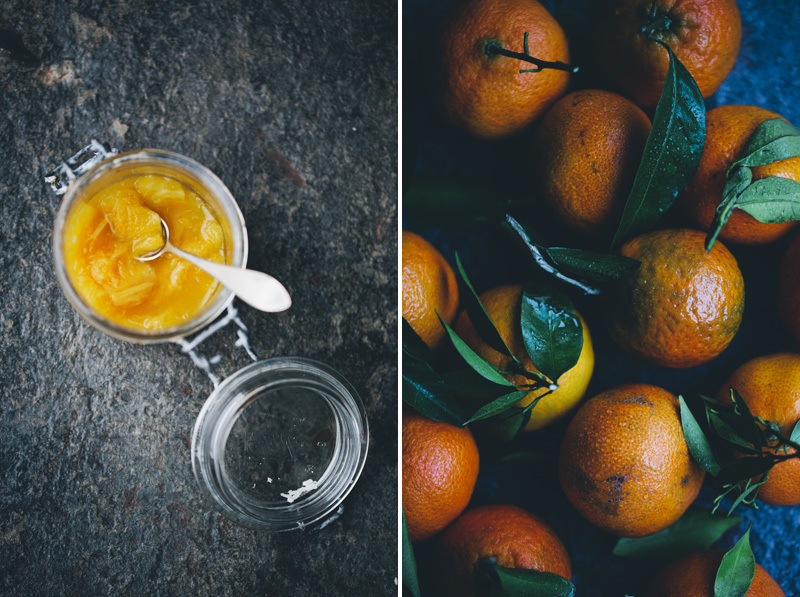 We have been experimenting with different citrus jam and marmalade recipes all winter. The photos show a cooked version, but since then we have grown much fonder of a simpler uncooked version using chia seeds. What we like about it is that it keeps the fresh flavours from the citrus whereas cooked jams and marmalades become a tad bitter and overly sweet. This Citrus Chia Jam is very easy to make and taste just like sun-ripe citrus fruits. Drain and rinse quinoa, and place it in an upright blender. Add oats, ¼ cup coconut, almond milk, chia egg (or regular egg), coconut oil, vanilla, baking powder, and cinnamon. Blend on high speed for about 40 seconds or until completely smooth, scraping down sides as necessary. Add remaining coconut and lemon zest and stir with a rubber spatula to combine. Warm a wide cast iron skillet over medium heat; add about 1 teaspoon coconut oil and spoon in ¼ cup batter for each pancake. Spread the batter out a little with the back of a spoon to make a 4-inch pancake. Cook for about 3 minutes or until surface is covered with bubbles and bottom is golden and beginning to brown. Flip and cook for another 2 minutes or until golden brown. Remove from skillet and repeat with remaining batter. These pancakes are best hot off the pan, but they can also be kept warm in a 200ºF / 90°C oven as you cook the whole batch. 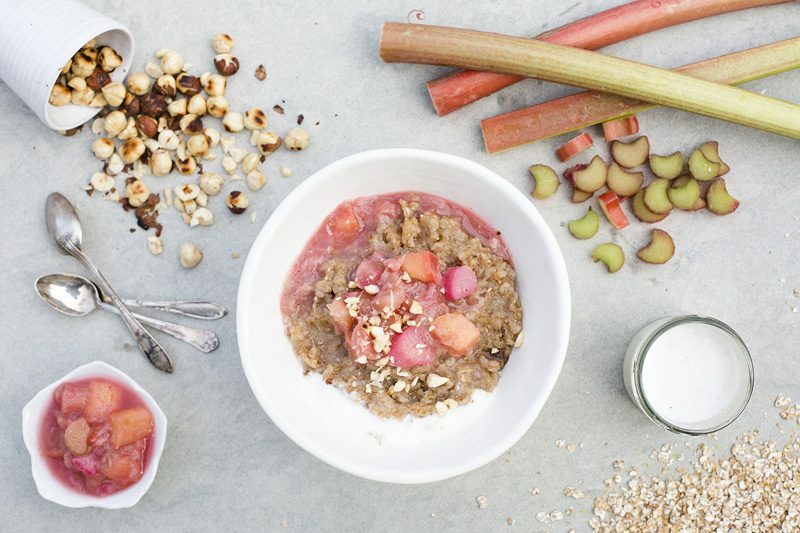 Serve with Quick Citrus Chia Jam or fresh fruit and a dash of maple syrup. 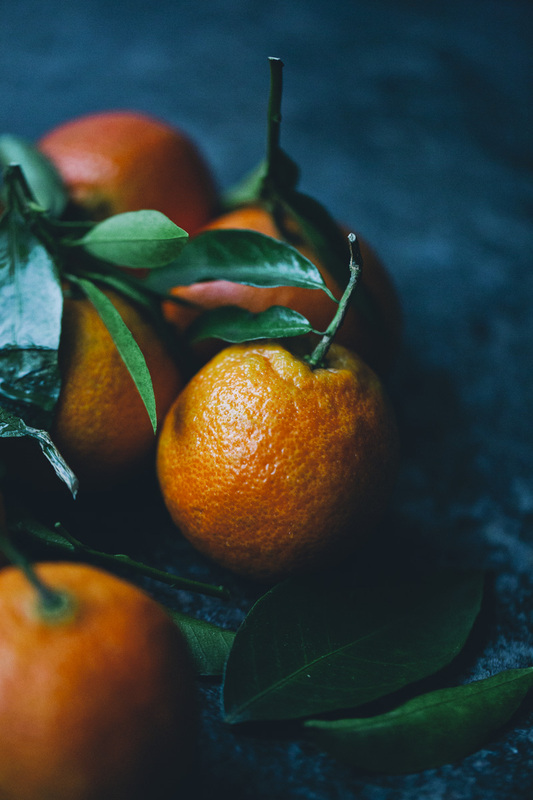 Peel two of the mandarins and chop the slices into small pieces that you place in a small bowl. Cut the remaining mandarins in half and squeeze out all the juice into the bowl. Add honey and chia seeds. Use a fork to whisk until all is combined. 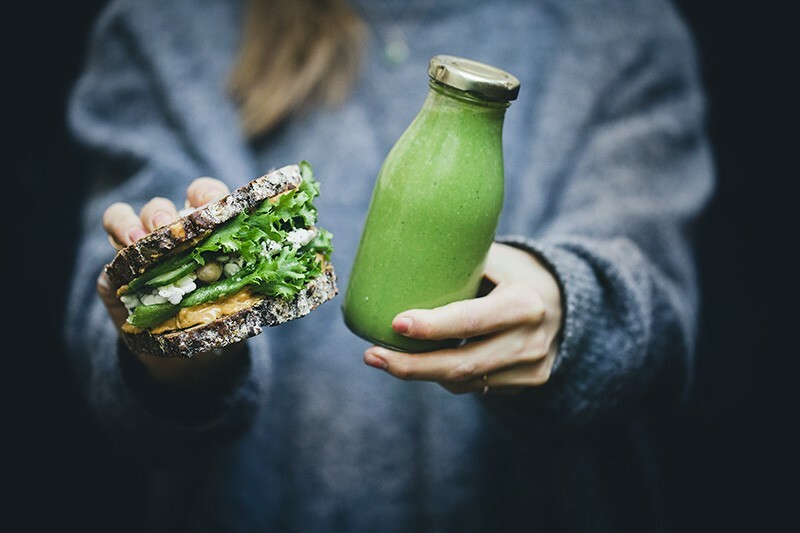 Leave in the fridge for a few hours or overnight, whisk once or twice to prevent the chia seeds form forming lumps. The chia seeds will bind the juice into a jam-like consistency. Store in a sealed jar in the fridge for up to 3-5 days. PS. 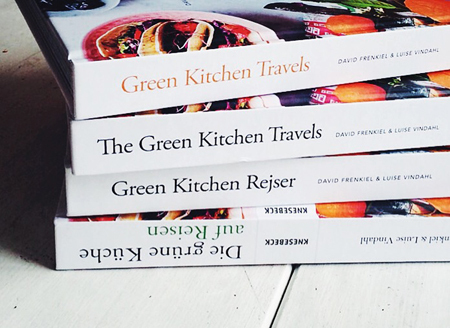 Green Kitchen Travels is being released in German, Dutch, Swedish and Danish during these next couple of weeks. 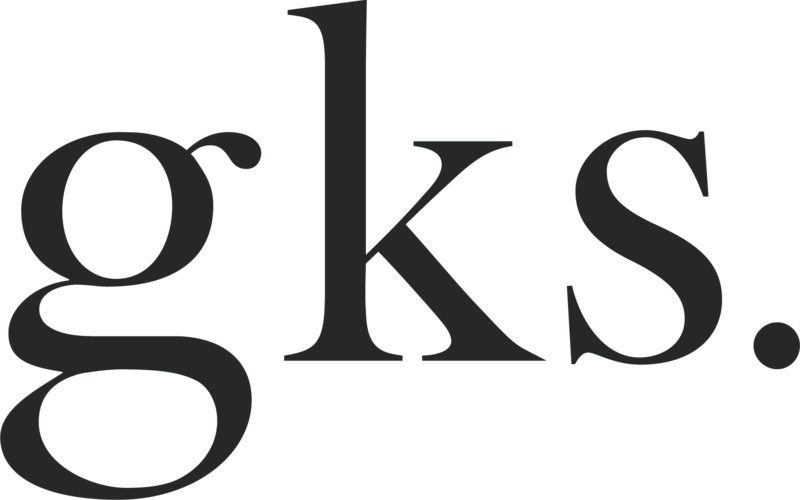 Check out our book page for more info! These look delicious! Can't believe your trip is almost over. Thanks for sharing it with all of us! I am so excited to a JAM with no cane sugar in it. I'll be making this today/tonight with a little honey. I wonder if it would work with other fruit too? I have this recipe flagged in Amy's cookbook and am excited to make it soon. There's nothing better than having to merely blend and cook the morning of! Yum! I will be making these this weekend! Ground vanilla is listed twice in the ingredient list for the pancake batter. Is that correct? Also, is it ok to use liquid vanilla if I don't have ground? Thanks! I have Amy's book and it is one of my favorite books ever. So gorgeous! 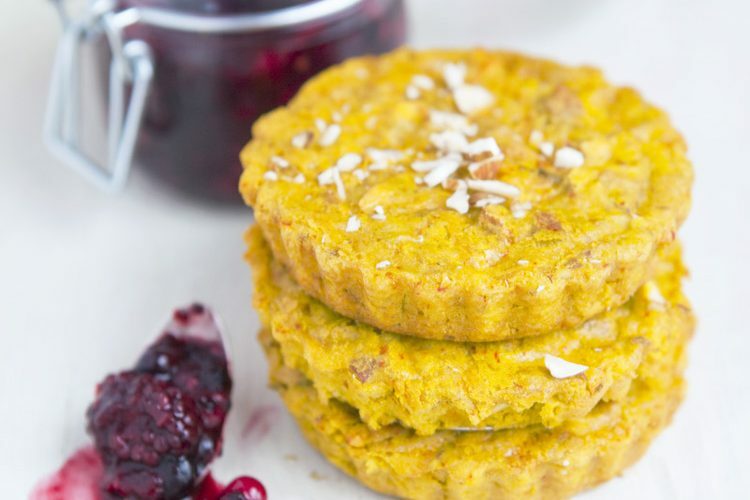 I have yet to make these pancakes, as I always forget to pre soak the quinoa, but I am going to go do it now. Thanks! I love coconut pancakes! The jam sounds awesome! Hi do you thinkI could replace the soaked quinoa with quinia flour? Travelling is great and it is always sad to go home. Maybe you should start planning the next trip already! Enjoy your last days! Love trying out your food, just noticed on the pancake recipe that vanilla is listed twice, should the second on be something else? I received yesterday Amy's book and can't take my eyes from it! Will certainly try these pancakes! We watched the video where you were making the frittata together with Elsa: she is so beautiful! Thank you for the video! So many gorgeous flavours in this recipe. These pancakes are lovely! those are the best looking pancakes i've ever seen! 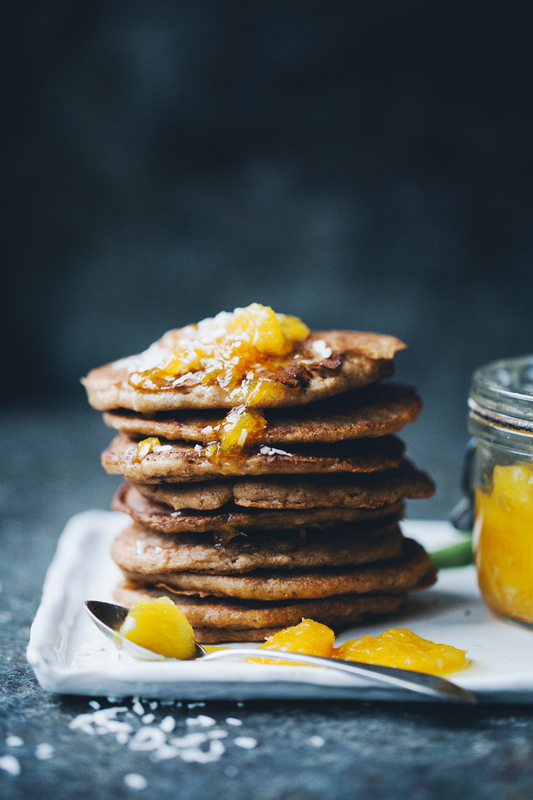 Yay for vegan pancakes and those photos of the citrus fruits are so insanely pretty!! !